Beijing's policy of draining surrounding regions to ease water shortages in the ancient capital is akin to "quenching thirst by drinking poison," according to a new report by Probe International's Beijing-based researchers. To keep water flowing to Beijing's "green" Olympics this August, the water-strapped city is pumping water from four newly-built reservoirs in nearby Hebei province, depriving poor farmers of water for their crops. City officials insist the water is needed for supplying Olympic venues and providing the Olympic Village with drinkable tapwater. And they say more water transfers will be needed from the Yangtze River by 2010 and beyond, to meet Beijing's rapidly growing demand for water. 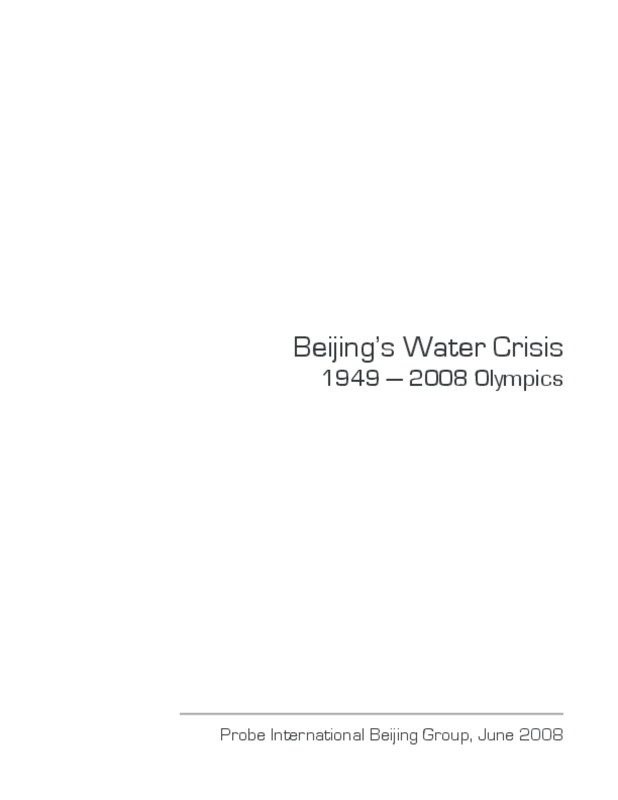 But large-scale water transfers won't solve the fundamental problems facing Beijing, says the report, Beijing's Water Crisis: 1949 to 2008 Olympics. Nine consecutive years of below-average rainfall combined with rapid urban expansion, dumping of wastewater and sewage into Beijing's waterways, and overpumping of groundwater mean the city of 17 million people is fast exhausting its water supply. Rather than endless expansion of the city's water supply by expropriating water from other jurisdictions, the report recommends better governance of water resources and the water industry -- including restrictions on urban development and water-guzzling industries, enforcement of anti-pollution laws, tradable water rights, and UK-style regulation of water utilities.